Any squirrels trying to nest in my basement will get a rude awakening when my two cats hunt them down. Seriously, I will be babysitting my mom’s Schnauzer soon and she will scare the beejesus out of all of them. LOL That is a FAT squirrel 😉 My son likes to watch them run around and be crazy. He sits outside and cackles at them. “Look, their running down the sidewalk!” “Look, there’s one in the basement! !” Yeah, we have all kinds of squirrely fun! Yes. It must be all the peanuts. We had a hawk in the yard last night and I joked that the squirrels better start waddling away! 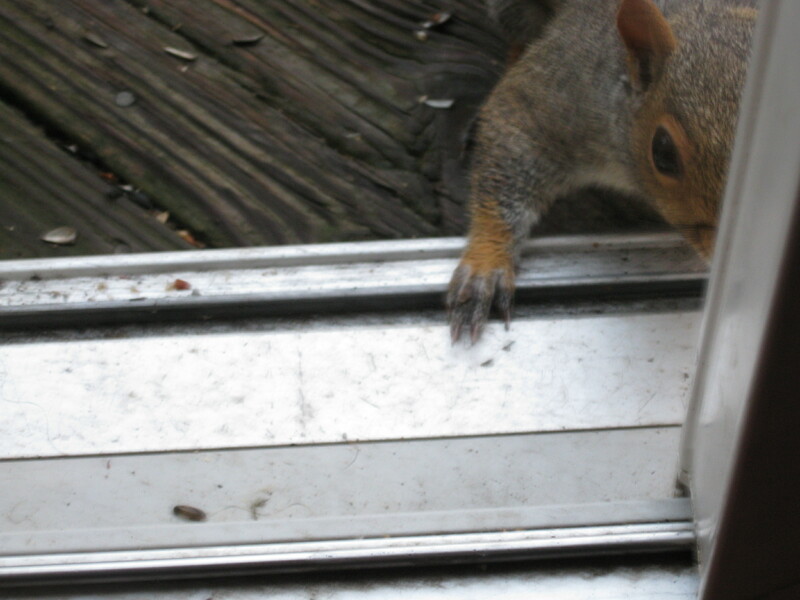 I once set up feeders on my deck for the squirrels but one day saw a rat eating out of it … that was the end of feeding the squirrels. No more putting little dishes out on the deck, I now have hanging bird feeders which they frequent. I like to watch them and always feed them over the winter. I have discovered they love crackers with peanut butter. I like to give them peanut butter on the ends of the bread that no one will eat. Or I give it to the birds. We also have Blue Jays that swoop down and steal all the peanuts from the squirrels. 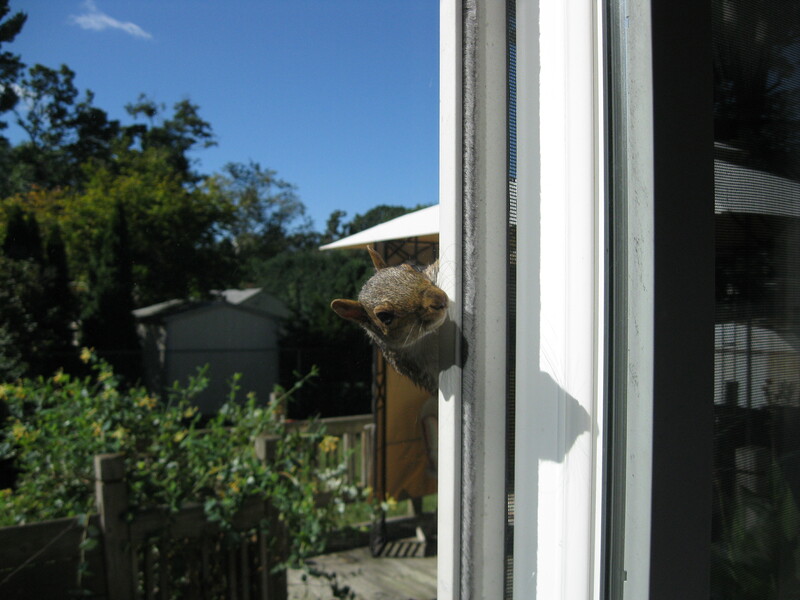 The only squirrel I like is Rocket J. Squirrel, because he would never eat the pears off my tree, chew holes in my cabin or take up residence there with a few dozen of his closest friends and relatives! They are cute — until you realize the hard way that they are just born for destruction. 🙂 I love the chipmunks though. Go figure. One year the squirrels (or maybe a raccoon) ate the gas hose on our gas grill. Because the grill came from Sears we had to special order the part (total pain). 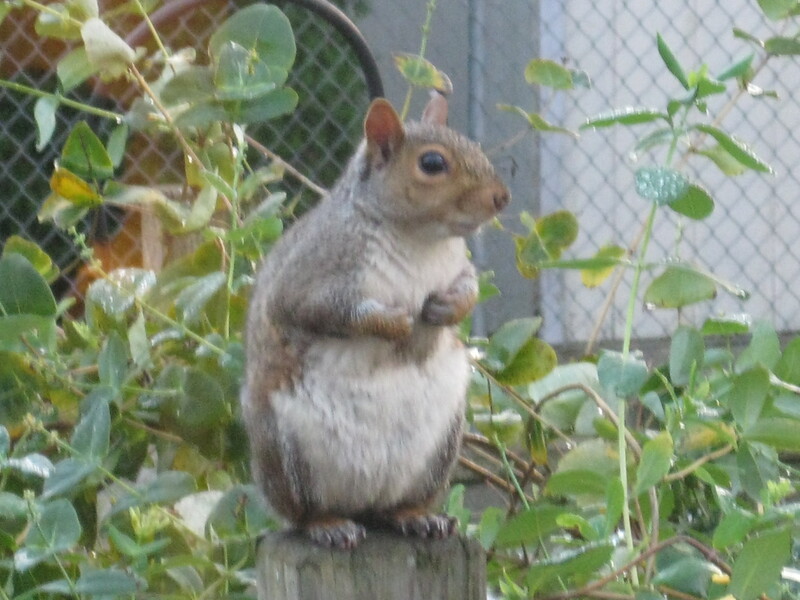 When I was in college in DC, I had a campus squirrel buddy named Stubby (because her tail was down to a nub). I used to carry peanuts in my backpack for her. I still think about her after all these years. I am a total squirrel nerd. I love them too, Casey, esp. the chipmunks! 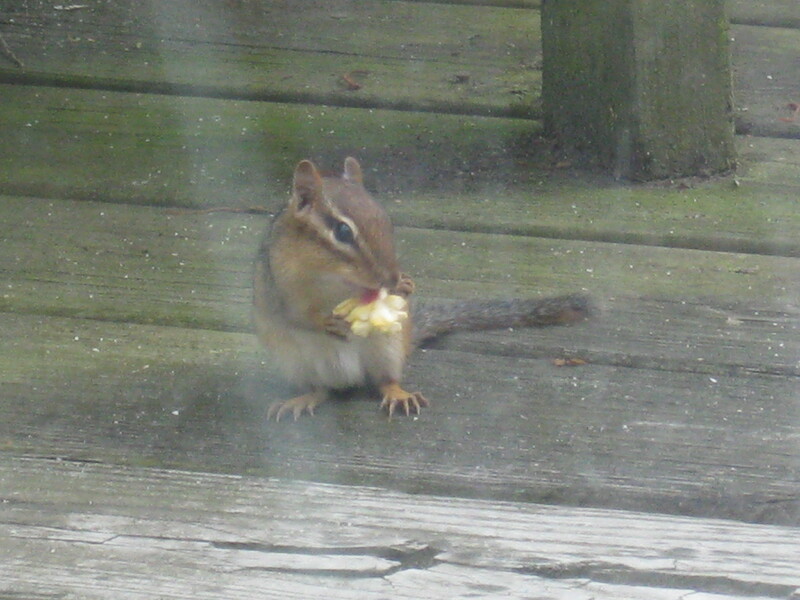 We have one who hangs out on our back deck, called “Chippie” in our house. I’m dying to bring one in to play…and my cat feels the same way too! Too funny. We all our chipmunks Chippie too. There are three, but one has a shorter tail so he or she stands out. For some reason they haven’t been around. I hope they are okay. See, I worry! I know my cats would love a shot at the chippies. I’m with you, Casey. I think they’re adorable. I have a family of squirrels that hang out behind my house also. I’ve never thought of leaving peanuts for them, but maybe I’ll follow your lead and try to make friends. 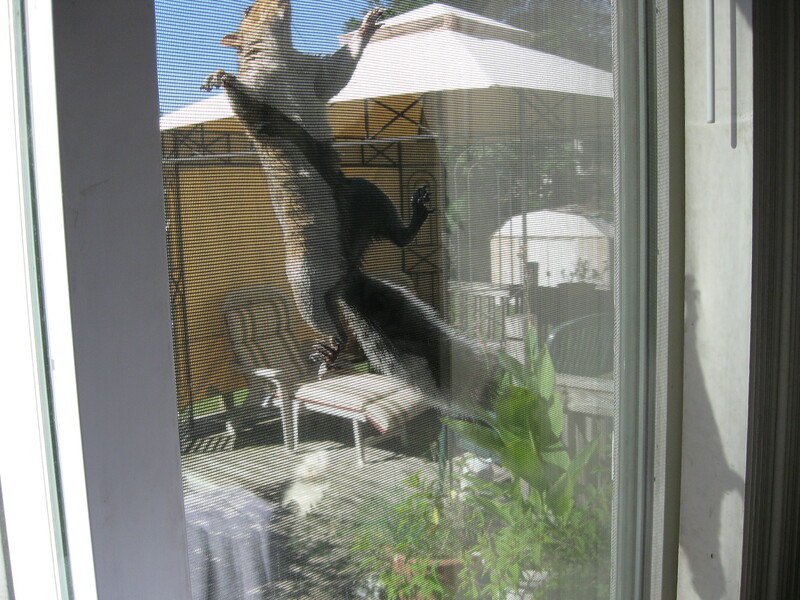 I love squirrels, but you never know, they might move in with you! I hope they don’t because my cats would get them. Or my mom’s dog. It’s in her DNA to go after rodents (being a Schnauzer and all!). 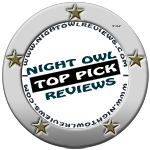 Thanks Jill! I wish I could snap a shot of the Blue Jays. They have gotten into the fray now but they move faster than my pokey camera!